Speech and hearing science professor Brian Monson and his colleagues found delays in the maturation of the auditory cortex of preterm infants. These disruptions were associated with language impairments in the children at age 2. 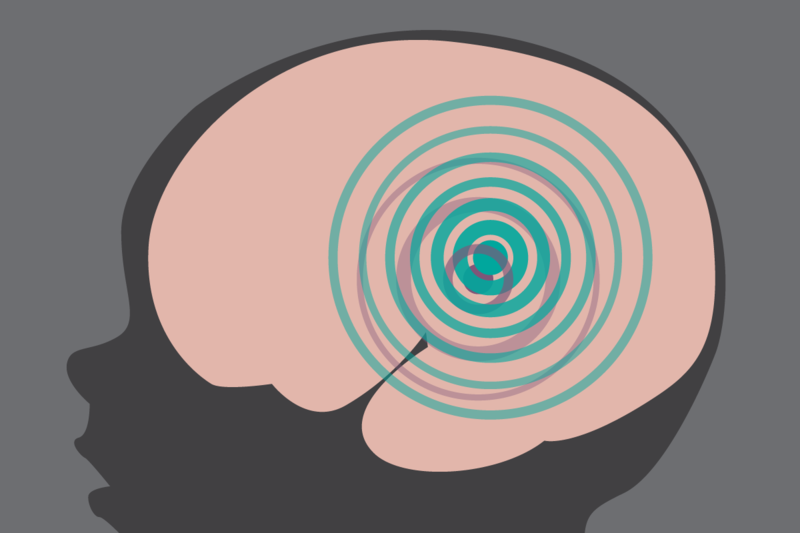 CHAMPAIGN, Ill. — Preterm babies born early in the third trimester of pregnancy are likely to experience delays in the development of the auditory cortex, a brain region essential to hearing and understanding sound, a new study reveals. Such delays are associated with speech and language impairments at age 2, the researchers found. 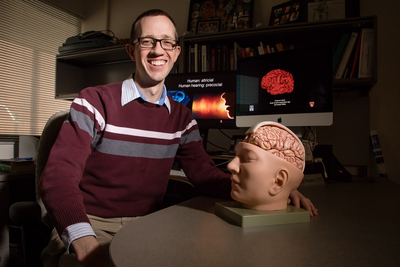 "We have a pretty limited understanding of how the auditory brain develops in preterm infants," said University of Illinois speech and hearing science professor Brian Monson, who led the study. "We know from previous research on full-term newborns that not only are fetuses hearing, but they're also listening and learning." Ultrasound studies reveal, for example, that, beginning at least as early as 25 weeks into gestation, fetuses will blink or move in response to externally produced sounds, he said. Other research shows that newborns prefer to listen to sounds - such as music or speech - that they were exposed to in the womb over unfamiliar sounds. And electroencephalogram studies of the brains of preterm infants show electrical activity in the auditory cortex in response to sound. "From these types of studies, we know that fetuses in the third trimester of gestation are hearing, learning and creating memories," Monson said. "It's pretty remarkable that such an immature system already has the ability to start distinguishing and learning." To better understand how the auditory cortex matures in the last trimester of gestation, Monson and his colleagues turned to a large dataset collected at the St. Louis Children's Hospital Neonatal Intensive Care Unit between 2007 and 2010. The 90 premature infants in the study had undergone magnetic resonance imaging one to four times in the course of their stay in the NICU. Another 15 full-term babies were recruited from the Barnes-Jewish Hospital in St. Louis and scanned within the first four days of life. These scans were used as examples of uninterrupted fetal brain development, for comparison with the preterm babies. The team used diffusion neuroimaging to study development of the auditory cortex in the infants' brains. "This technique measures the diffusion of water in the brain tissues, which can tell you a lot about the development of neurons and axons," Monson said. As brain structures grow and mature, water diffusion in the gray matter and white matter also changes in recognizable patterns, allowing researchers to track how the tissue is developing, and at what rate, he said. A new study focused on delays in the development of the auditory cortex in preterm infants. "We wanted to know: What is the relationship between these two regions? Do they mature at the same time, but at different rates? Do they mature at different times but similar rates?" Monson said. "A different rate of maturation may render one tissue more vulnerable to injury or disruption associated with preterm birth." The analysis revealed that by 26 weeks of gestation, the primary auditory cortex was in a much more advanced stage of development than the nonprimary auditory cortex. Between 26 weeks and about 40 weeks - the latter the equivalent of full-term birth - the nonprimary auditory cortex in the preterm infants matured quickly, partially catching up to the primary auditory cortex. Both regions appeared less developed at 40 weeks in the preterm infants than in the full-term babies. "It's exciting to me that we may be able to use this technique to help predict later language ability in infants who are born preterm," he said. "I hope one day we also will be able to intervene for those infants who may be at greatest risk of language deficits, perhaps even before they begin to use words." The research team also included scientists and physicians from Harvard Medical School, University College London and Washington University School of Medicine in St. Louis. The National Institute of Child Health and Development, the National Institute of Neurological Disorders and Stroke and the National Institute of Mental Health supported this research. To reach Brian Monson, call 217-300-6212; email monson@illinois.edu. The paper "Differential rates of perinatal maturation of human primary and nonprimary auditory cortex" is available online and from the U. of I. News Bureau.